With the last day of 2010 just hours away I thought I would reflect with you on what I thought was the "biggest" astronomy-space story of the year. I offer no justification for my selection except that it is a personal opinion. History will record that the direction of the US manned space program changed, for better or worse, in 2010 with the Obama Administration cancelling the Constellation Program - or at least the majority of it. In 2004 President Bush set in motion the goal that the US return to the Moon to explore and stay this time via robotic and manned missions. Once accomplished this would provide the experience and hardware necessary to try for a manned Mars mission some decades later. Constellation - http://www.nasa.gov/mission_pages/constellation/main/index.html - was created to accomplish these goals and NASA put it all into motion. The new Administration wanted a comprehensive review done on Constellation and then would decide what to do based on the recommendations. The Augustine Commission completed its review -http://legislative.nasa.gov/396093main_HSF_Cmte_FinalReport.pdf - and in October 2010 The President signed into law Constellation's demise. Commercialization of manned spaceflight is getting close to reality and NASA may be out of the low earth orbit - taxi service to the International Space Station (ISS). The recent launch by Space X of its Falcon 9 rocket and attached Dragon capsule is getting close to giving the US a means to get people and cargo to ISS and not rely on expensivee Russian Soyuz flights. But will the US make good the talk of going to asteroids via a manned mission? Will required hardware and political will of the President AND Congress be there????? I truly don't know but I doubt it. Manned spaceflight is going to be such a low priority with the incoming and sure to be infighting Congress that the 2, possibly 3 remaining shuttle flights will be it for NASA as a manned spaceflight entity for some time to come. There is money to be made via commercialization of maned spaceflight so that will be the prime time concern of Congress and the accompanying politics/lobbyists. I had hoped to see the day when US astronauts walked and colonized the Moon. Instead, I will see Taikonauts (Chinese astronauts) doing so. They have the money and political will to do so and will probably get to the Moon in a decade. The Helium 3 and other resources of the Moon will be theirs. Do you think China will act in the best interests of all humanity while they are the only country on the Moon? History will look at 2010 as a watershed moment in the history of the manned spaceflight program of the US - one way or the other. Only time and political will tell. Have a safe and joyous New Year celebration wherever you are. Asteroids are the left over rocky remnants - and perhaps directly related to comets - that occupy the space between Mars and Jupiter, as well as other areas in the solar system. Asteroids pose a direct and real threat to our existence as an impact from a kilometer sized object would be devastating if it were to occur in a populated area or in the oceans near a population center. The more we learn about them the better we will be able to defend ourselves against them. There are several world-wide patrol efforts ongoing that are looking for these threats every clear night. We have sent numerous missions to asteroids and have actually landed on them. But in 2010 there was a Japanese Aerospace Exploration Agency (JAXA) mission that not only landed on an asteroid, but took off to return to Earth with samples in a capsule! 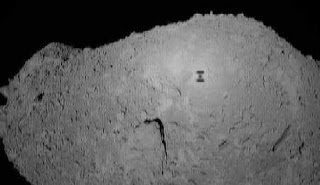 JAXA's Hayabusa spacecraft returned microscopic particles of the Itokawa asteroid and scientists have been studying them. The results will be released at a science conference in March 2011. For centuries comets - those cosmic snowballs left over from the formation of the solar system - were hunted and found by dedicated amateur astronomers using telescopes with an occasional photographic find. Want to know who has found the most comets in history? 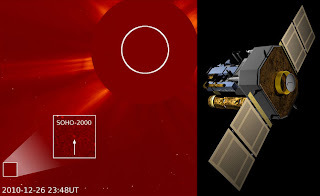 The answer is not a human hunter, but a spacecraft that monitors the Sun! NASA/ESA's Solar and Heliospherical Observatory - SOHO for short - discovered its 2000th comet on December 26th. Citizens monitoring SOHO via the Internet have searched images from the Sun watching spacecraft to find many of these sun grazing comets. Read More About It: http://www.nasa.gov/mission_pages/soho/comet-2000.html. Maybe you can find one! Did you get caught in the big east coast storm? 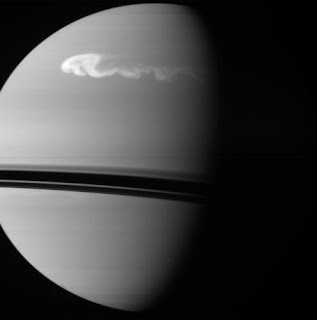 Well, check out the big storm on Saturn! This storm is high in the outermost atmosphere of the ringed planet. It has been monitored by amateur astronomers and NASA's Cassini Mission recently captured this wonderful view. Space Shuttle Discovery, which I saw on Pad 39A from about a mile away 2 weeks ago today, was rolled back into the Vehicle Assembly Building (VAB) on Dec. 22 for further tests. The tests consist of x-rays of all 108 aluminum stringers in the External Tank (ET) and will hopefully shed some light on why cracks were discovered in several of the stringers which are located in the ET intertank. The work is supposed to commence today and continue for the next week. Dec. 30th is currently scheduled as being the decision point on whether modifications will be needed on the ET. I'll update you as facts become available. At the Kennedy Space Center I saw the firing room for all of the Apollo launches to the Moon. I also saw the launch pads, the massive crawler that took the Apollo-Saturn V stack out from the Vehicle Assembly Building (VAB) (which was cool to see as well). I also saw the last pristine Apollo-Saturn V which was amazing. With the Christmas season and the KSC experience, I could not help but remember Apollo 8 - Christmas Eve 1968 - as Borman, Lovell and Anders orbited the Moon and read from Genesis for the entire world to hear and see. Please see http://www.nasa.gov/topics/history/features/apollo_8.html and see the video. 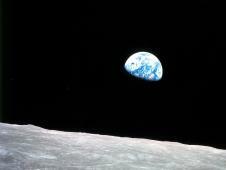 Apollo 8 - Bill Anders took it - also took the first Earthrise picture which became an icon for the ages. When Apollo 8 was in orbit and reading from Genesis I was outside with my brand new 6-inch Newtonian Reflector telescope from Edmund Scientific looking at the crescent Moon while listening to the broadcast. I could not see the spacecraft of course, but I could see the Moon and knew where they were in orbit. This was a very inspirational moment for me in my life.....I had tears in my eyes and a true connection with the Moon. May you and yours have a safe, joyous and wonderful holiday season. I'm back from a great 12 day getaway that included a fantastic visit to the Kennedy Space Center and viewing the total lunar eclipse on a ship. I'll have more about it during the coming days. I'm off to some places where I may not be able to hit the 'net. I have left blogs and a December skies summary for you to use for the Geminid Meteor Shower on the night of the 13th-14th and the total lunar eclipse on 12-21. We'll get caught up when I surface again, probably on the 23rd. Clear skies for everyone and Happy Holidays! History was made today with the successful launch at 10:43 a.m. of Space Exploration Technology Corporation's (SpaceX) Falcon 9 rocket carrying a Dragon capsule from Cape Canaveral Air Force Station's launch complex 40. After two orbits the Dragon capsule re-entered the Earth's atmosphere and splashed down in the Pacific Ocean and was recovered. This is the first time in history that a commercial company has recovered a spacecraft from orbit. Only government programs have done this before. This is a huge step forward in the commercial orbiting program that NASA and several companies are pursuing. The goal is to use commercial rockets and spacecraft to ferry cargo and ultimately astronauts to the International Space Station (ISS). Once the Space Shuttle program is completed - there are only two flights left - the US will have to rely on Russia and its' Soyuz spacecraft to get supplies and astronauts to ISS. This meteor shower does not disappoint those who get out in the cold temps and bundles up for the show. My oh my! What month of skywatching December brings as the Geminid Meteor Shower and a total lunar eclipse take top billing. But first, join me at George Mason University Observatory on Monday, December 6th (weather permitting) at 6:00 p.m. Make sure you dress warmly. Check here for more details and weather status http://physics.gmu.edu/~hgeller/observing.html. The Geminid Meteor Shower takes place on the night of the 13th-14th. This is a very active and enjoyable event as from a dark sky site observers can see perhaps 60 to 100 meteors an hour. Even from suburban skies it is worth looking as these bits of debris from asteroid 3200 Phaethon really are pretty bright. Meteor showers are usually caused by cometary debris so the Geminids are unique. To see the Geminids, start looking to the northeast at around 8 p.m. to 9 p.m. The best time to look will be after midnight up to dawn. Find a comfortable spot to put a reclining lawn chair, or just lie down on a blanket-sleeping bag, bundle up and cast your gaze overhead. On the 21st the Full Moon enters the Earth’s dark shadow at 1:33 a.m., and remains partially eclipsed until the beginning of totality at 2:41 a.m. The Moon will remain totally eclipsed until 3:53 a.m. with the last trace of partial eclipse ending at 5:01 a.m. You do not need optical aid to see the eclipse but binoculars or a small telescope will enhance the view greatly. The eclipse will be visible even in the city as long as you are not directly under or staring into a street light. This is the first total lunar eclipse for our area in almost 3 years so make sure you get out to see it. The dark shadow of the Earth’s limb will be seen curving across the face of the Moon during the partial eclipse phases. During totality, we will possibly see a reddish-copper colored tint or it may be other colors ranging from almost black to dark reddish-brown on the Moon. The colors are caused by the refraction (bending) of sunlight by the Earth’s atmosphere – all of the planet’s sunrises and sunsets that are occurring around the world. The tint of the colors depends on the conditions present in the atmosphere – if it is clear a copper color may rule while major fires or volcanic eruptions may create darker red-browns or almost no color. If you were on the Moon you would see a 360-degree colored ring of light around the Earth and see the same color on the lunar surface. Stars would be everywhere as the Sun would be blocked – what a view it would be! The Winter Solstice (the start of winter) occurs at 6:38 p.m. on the 21st and marks the longest night of the year. Mercury is very low to the western horizon and not easily seen. Brilliant Venus continues to grace the morning sky in the east rising 3 hours before dawn as the month begins. By mid-month Venus will be 30 degrees above the horizon. Mars is hard to see low in the west at sunset. Bright Jupiter is well up in the south at sunset and remains visible until about midnight. If you have binoculars or a telescope you can watch the four main moons of Jupiter change their position night after night. Saturn rises in the eastern sky at 2 a.m.
New Moon is on the 5th, First Quarter Moon is on the 13th and this month’s Full Moon occurs on the 20th. This month’s Full Moon is called the “Full Cold Moon or the Full Long Nights Moon” in recognition of the start of winter. Last Quarter Moon is on the 27th. Here are our down to Earth events for this month. Open House at the Department of Astronomy at the University of Maryland, College Park Campus Observatory, will be at 8 p.m. on the 5th and the 20th. The National Capital Astronomers (NCA) have their monthly meeting on the 11th at 7:30 p.m. at the University of Maryland, College Park Campus Observatory. The speaker is Dr. Scott Sheppard, Satellites of the Giant Planets. The Northern Virginia Astronomy Club (NOVAC) will meet at 7 p.m. at George Mason University (GMU) on the 12th. The speaker is Professor Sylvester Gates from the University of Maryland. Professor Gates will be giving an update of the status and results to date from the Large Hadron Collider. Read More About It: http://www.novac.com/meetings/index.php . NOVAC will host a public star party on the 4th at Sky Meadows and CM Crockett Park. These events are a great opportunity to get out under the stars and look through a wide variety of telescopes. The United States Naval Observatory (USNO) has Monday night tours but space is limited. The National Air and Space Museum (NASM) has several space related activities this month. Read More About It: http://www.nasm.si.edu/events/calendar.cfm. The TriState Astronomers General Meeting will be held on the 15th, 7:30 p.m. to 9:30 p.m., at the William Brish Planetarium, Commonwealth Ave, Hagerstown, MD. Got a Topic That Interests You? I literally have a whole universe of topics to select from for my blog. But I'm interested in hearing from Space Placers about what interests them. Feel free to contact me at skyguyinva@gmail.com with your suggestions and comments. Space Shuttle Discovery will remain on the launch pad until at least Feb. 3rd, 2011. NASA announced the move following a mission status meeting on Thursday. Engineers need more time to study the cause and effect of the two cracks found in the U shaped aluminum stringers on the external tank. The cracks have been repaired and the insulation replaced, but it is still not known precisely why this happened. Tests and scanning of the tank will hopefully provide some answers so Discovery can be launched. 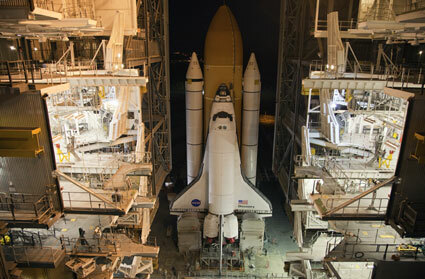 Space Shuttle Endeavor will now look at an April launch date for the last shuttle flight. The much anticipated NASA Astrobiology-Extraterrestrial Life related press conference today - 12-2-10 - was about an Earth-bound discovery. I and I am sure a lot of others did not expect the announcement to have to do with Mono Lake in California! A team of NASA backed researchers found a microorganism that can survive and thrive using arsenic instead of phosphorus for key biological processes. This is the first instance of such a discovery and it basically says that life as we know it has just been expanded. The biology textbooks will have to be rewritten and this discovery begs the question, "What else can life do that we are not aware of?" Life as we knew it before today's announcement can exist in extreme environments of heat, cold, pressure, drought, high and low Ph levels. 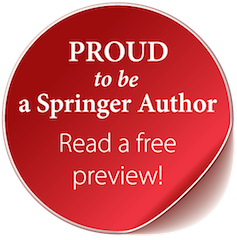 Now we find that life can exist beyond the original six basic chemical elements and using an element that is toxic and fatal to life, including humans. I am convinced that life is teeming in the Universe and that life always finds a way to survive. Has NASA Found ET or Little Green Men? Have you heard the buzz on the 'net about NASA's press conference set for Dec.2nd? Some are going so far as to say they think the announcement will be that extraterrestrial life has been discovered! The press conference will "discuss an astrobiology finding that will impact the search for evidence of extraterrestrial life." BTW, Astrobiology is the study of the origin, evolution, distribution and future of life in the universe.